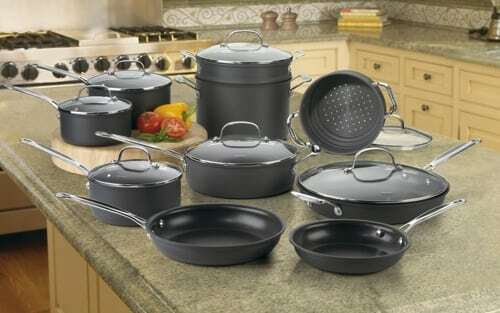 This amazing 17-piece cookware set made by Cuisinart revolutionizes the world of pots and pans by introducing great construction materials meant to get your mind off the technical details and focus on the art of cooking. 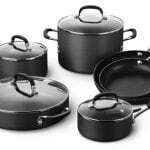 The Cuisinart 66-17 Chef’s Classic Nonstick Hard-Anodized 17-Piece Cookware Set is an absolute breakthrough because of many reasons, not to mention a deluxe set. It does not surprise by the shape of its components, which keep a classic and very useful line, but by durability, balance and efficacy. The non-stick surfaces from the interior of every component are made of quantanium, which is reinforced by titanium. These metals might not sound familiar to you, but the point is that whatever you cook, the ingredients will just slide of the pans and pots. The stainless steel handles are a breakthrough as well because they balance the weight of the pot or skillet and they do not get hot while you cook. These handles ensure a very comfortable grip and they even come with loops at the end for you to hang them on the wall if you want to. The lids are made of glass and stainless steel and come with wide handles, especially contoured for an easy grip. 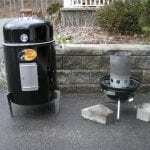 Cuisinart was founded in 1973 by Carl Sontheimer. This company has started as a producer of food processors, aiming for quick and easy ways of cooking. Since 1989 it is under the management of the Conair Corporation. That was about the time when Cuisinart has started to produce a wider range of products. In our days, Cuisinart covers the needs of every kitchen entirely. Bakeware, cookware, coffee makers, ice-cream makers, food processors, as well as other appliances and utensils are part of their offer. You name it, they have it. Numerous professional chefs sustain and promote the products made by Cuisinart, which proves the products are very reliable, high-quality and definitely a must-have. 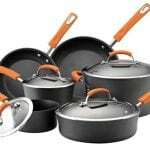 Hard anodized construction – The bottom of every cookware included in the set is composed of a layer of quantanium non-stick material, a layer of pure aluminum and a coat of hard anodized material. 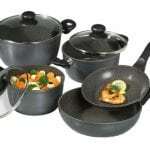 Ideal handles – The handles from the lids, pots and skillets are confortable to grip, sturdy enough to sustain and balance their overall weight and professionally riveted. Pour without loosing a drop – The rims are tapered, so they form the perfect angle to pour the content on a plate or in other vessels without losing a drop or making a mess. Not dishwasher safe – The external material will become dull if the pieces are washed in a dishwasher and not by hand. 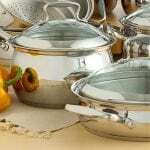 Easy to scratch – The coating gets scratched easily when metal utensils are involved in the cooking process. 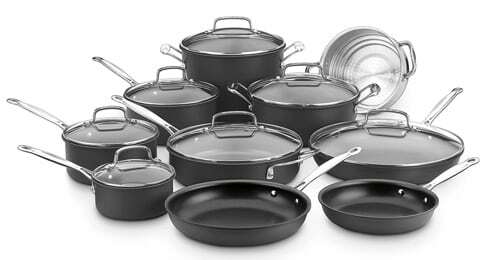 The Cuisinart 66-17 Chef’s Classic Nonstick Hard-Anodized 17-Piece Cookware Set is definitely a deluxe set that can be used by both professional and amateur chefs. 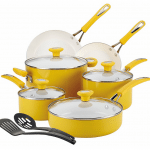 If you are a gourmand and you cook for the pleasure of taste, not just for basic feeding needs, this set is a perfect match.